It’s been awhile, but I previously reviewed another book by Jonathan Evison, This is Your Life, Harriet Chance. That book easily was in the top ten of the books I read in 2016 as one of the best I’ve read. 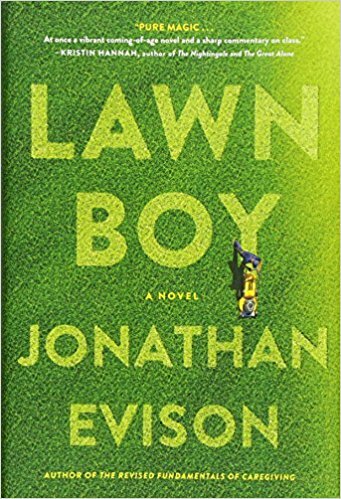 Evison’s latest output, Lawn Boy, is just as enjoyable. For some of us who struggled with finding our way in the professional world after high school, some of the events in this new book may be painfully familiar. In Lawn Boy, Mike Munoz is living in Bremerton, Washington, trying to eke out a living working on a lawn crew as a landscaper. He has dreams of bigger things. He doesn’t want to scoop poop or simply cut lawns. He wants to artistically trim the trees and shrubs.Unfortunately, he abruptly leaves that job over his perceived work conditions. Munoz lives in a hand to mouth reality with his single mother and handicapped brother. His income, though limited, was essential to the running of their household. Already nearly an absentee parent, his mother must pick up the slack, and they rent out the shed in the backyard. Mike must take on a series of jobs that gives him some cash, but a pile of headaches, too. From poor choice to poor choice, Mike starts to discover himself, and tries to move beyond the seemingly dead end life in which he’s wallowing. Stuck in between his high school life and adulthood, he slowly comes to the realization that everything he thought he knew about himself was not quite right. Through those series of missteps, his life gradually unfolds and blossoms. What Evison gives us in this novel is not a flashy and glamorous life like we see so often on television. Instead, we get are the little dirty parts that we all try to pretend don’t exist. This is the story of a man who has to overcome several obstacles to make his way forward. There was no easy solution for Munoz to grab ahold of. He had to work for everything, and it was hard work. Evison creates characters that resonate with the reader because we can all relate. When you take off the shine we spin in our own stories, so many of us have those ugly moments that help to define us as people. The author does that splendidly with Mike Munoz. Each time he tries something new, you want it to work out for Mike. Unfortunately, it oftentimes ends up as a rather nasty bump which sets you back a step. This novel is brilliant in that back and forth struggle. Just like This is Your Life, Harriet Chance, Jonathan Evison’s new novel, Lawn Boy, is a fun read that keeps you begging for more and rooting for the protagonist. You’ll leave this book with a sense of satisfaction as Mike finally seems to be able to rise above his station in life and discover who he really is and what type of person he wants to be. Many of us will recognize even just the tiniest sliver in Munoz’s character. Craig Bacon hates mowing the lawn. Luckily, he has at least one daughter who likes it. As for landscaping, he has visions, if not the energy.